Frontiers, the Switzerland-based publishing company run by EPFL professor and brain simulant Henry Markram and his wife Kamila and owned by the German giant Holtzbrinck and some investors, describes itself as “a community-rooted, open-access academic publisher”, and as such it boasts a ~71,000 head strong “virtual editorial office” which is bigger than the number of all Frontiers articles published since its inception in 2007 (~65,000). This communal character however doesn’t mean that the editorial board the size of a large town is invited to have any actual influence over editorial policies at Frontiers (which fits into one open-space office in Lausanne). In fact, the following guest post by Regina-Michaela Wittich, a former senior editor of a Frontiers journal, narrates how she was sacked by Frontiers because she rejected too many papers for being of insufficient scientific quality, instead of sending them into the “rigorous” Frontiers peer review process (allegedly “enhanced with artificial intelligence”) where rejection becomes quite unlikely, and reviewers are sometimes reminded of their duty to be constructive. That firing of an editor to protect the Frontiers business model was not even something special: in 2015, Frontiers mass-sacked 31 medical editors because they wanted to raise the bar and introduce some minimal standards on what counts as a medical publication. Thus liberated, Frontiers could finally publish cutting-edge medical research which the Illuminati try to suppress, e.g that vaccines make children develop neurological disorders, or that Parkinson’s and Alzheimer’s can be prevented simply by eating chocolate, or that indoor dampness is a cause for horrible debilitating disease best treated with thyroid hormone. The Lausanne-based publishing house is a powerful enterprise and not to be messed with. Frontiers annihilated Beall’s list and the entire concept of potential predatory publishers, after Beall dared to place the Swiss publisher on his now defunct list. Presently, Frontiers advises European Commission on the future of scholarly publishing. Frontiers claims to publish only “high-quality” research, and their secret is: “all papers [are] assessed to be technically correct and of good quality. Reviewers may recommend rejection based exclusively upon objective errors”. Which occasionally leads to pseudoscience, bunk, nonsense, and utter coucou stuff published in Frontiers. My regular readers already know some examples of what came out of “the most rigorous and objective reviews”, some of which I listed here. Just before last Christmas for example, Frontiers in Psychology brought for the romantically-inclined scholarly gentleman some statistically very significant “original research” on “romantic love and hate”, followed by a bit of scientific advice on how to get laid. The task of a good editor is to keep such awful stuff out, and indeed everyone with insider knowledge of editorial process in scholarly publishing knows what kind of scientifically abysmal drivel or salami-sliced offal editors get served every day. It is a business decision for an author-pays (Gold) Open Access publisher to reject all that, in order to maintain quality, or wave it though after some “rigorous” peer review, and pocket the article processing charges (with Frontiers up to $2950 a pop). It is not just a Gold Open Access problem: also subscription-based journals must fill their pages with something, or risk being thrown out of the subscription package or terminated by the publisher. sought after reviewers or editors for Science, Nature (and its clones), PNAS, Cell, ISMEJ, EMI, mBIO, AEM, FEMS journals and other journals that publish original research, reviews, opinions and perspectives in the field of Microbiology”. One of these section chief editors, Wittich, acted as reviewer for Journal of Bacteriology and Applied and Environmental Microbiology of the highly respected society ASM, for 12 years each. Her rejection rate there was of around 80%, yet noone complained, as she told me. At Frontiers, it was different. She was sacked, and her manuscript rejections reversed. It happened in July of 2012 when I received an invitation by email from Henry Markram, Editor-in-Chief of Frontiers, to participate in the launching of the new Frontiers in Biotechnology and Bioengineering Journal, in an editorial position. I agreed, and became, based on my preceding research fields and interests, an associate editor for the section on Microbial Biotechnology, Ecotoxicology and Bioremediation (MEB), in those days a section also being found within the journals Frontiers in Microbiology, and Frontiers in Environmental Science. In the coming years I took about 14 manuscripts – if I remember it correctly – from which two I rejected immediately because of being completely out of focus or with no chance to get editorially improved; the others went into the review system of Frontiers in Microbiology which became the dominant source for manuscripts submitted to the MEB section. Four years later, in mid-October of 2016, I was invited to replace one of the two specialty chief editors (SCE) of the MEB section who took on a new academic position and had to drop the function of SCE within the MEB section. For me, this resulted in becoming familiar with a new editorial task, and to work up many of the accumulated manuscripts from my predecessor which were still being in the interactive review process of the Frontiers system. This resulted for about three months in an almost full-time job, working for long in the very late afternoon and evening, including almost all of the weekends, until getting to equilibrium of incoming manuscripts and those to be channelled to publication or being rejected. Most of the time I spent in the evaluation of the quality of the scientific content of the manuscripts from which a relatively high number was below the acceptable level I was used to as a reviewer or associate editor for other journals within my field. As a consequence I let pass to publication several manuscripts of low scientific quality and/or generally unacceptable usage of the English language. Upon having reached the before-mentioned equilibrium also all of those type were rejected, especially when I couldn’t recognise any chance for significant improvement. In spring 2017 I received an email from the Executive Editor Frederick Fenter, announcing the payment of 7,500 € as a personal honorarium, a sum which I considered at least as adequate for the work I had invested as being an SCE for the Journal. On their web pages the Journal stated that ‘Frontiers in Microbiology publishes outstanding discoveries within its field’ what I understood as the journal would publish only outstanding discoveries. In 2017 I reminded several of the Associate Editors, including Guest Associate Editors responsible for a Research Topic, to have a stronger look on the quality of the manuscripts handled by them, in order to maintain a high quality; and in an extreme situation I managed, in collaboration with my SCE companion and the Editorial Office, the downgrading of two of the Associate Editors from the board (one of them had never edited a manuscript and I didn’t find any reason why he should continue in this function), and in an extreme case, the elimination from the board of two Guest Associate Editors who, over a longer period of time, had invited reviewers mostly providing non-substantive reviews; obviously in order to get their research topic rapidly filled with articles. During autumn of 2017 I made a rough calculation of the rejection rate of manuscripts handled within our MEB section: it had increased from about 25 % from my start as an SCE to about 37 %, when taking into consideration all those manuscripts from the early launch on of the section. In summer I had already been invited by the Frontiers Editorial Office to join the EcotoxicoMic 2017, the First International Conference on Microbial Ecotoxicology, to be held in November in Lyon (France) in my function of SCE and as such being responsible for a new research topic on that issue. The conference was sponsored by Frontiers, sponsoring also me by paying the inscription and a conference dinner; the costs for travel and lodging went on my wallet. At the conference I met one of the Frontiers Journal Development Specialists. This woman provided me with some statistical data generated from our MEB section. In this meeting she mentioned that the rejection rate within the MEB section had increased to over 60 %, a factor which could not be tolerated by the editorial office, and not without explaining to me that in the past a number of Frontiers’ Chief Editors had to leave the Journal. “… I notice that yesterday you rejected the manuscript 335975 submitted to the Microbial Ecotoxicology RT, without giving the Topic editors [Guest Associate Editors who suggested a Research Topic (RT) and responsible for the papers within their RT, – RMW] the time to assess it. I had a look at the manuscript and I do think it does fit the scope of the Topic. For this reason I believe the Topic Editors should be given the chance to decide whether the manuscript can go to review or not for a number of reasons: 1) they are established scientists and we trust their judgement 2) the authors of the manuscript were in the PC list [not clear what this is, -RMW] 3) one of the main principles of Frontiers is that we do not select for impact and we give the community (both authors and editors) the opportunity to decide which contributions might be relevant for the community. For these reasons, we will put manuscript 335975 back into review and allow the editors to assess it. “ … The recent rejections that have been reinstated into the review system have been reinstated because they have not undergone a fair, rigorous or transparent peer review process. 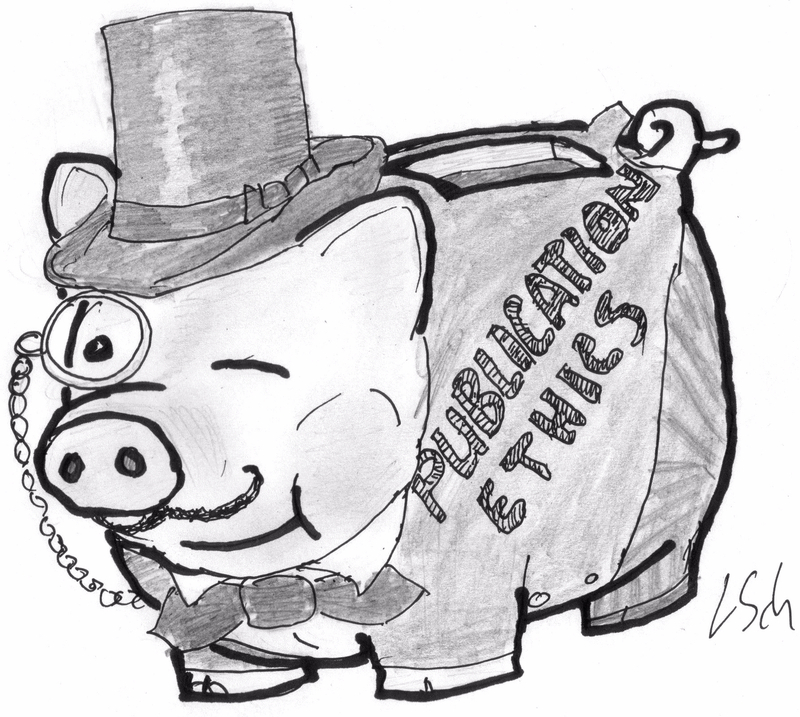 It is the collective responsibility of both the editorial office and our editors, particularly chief editors, to ensure that this fair, rigorous and transparent peer review process is carried out for every manuscript. As mentioned in my previous email, we seem to have unaligned expectations of the editorial process, and in particular the manner in which decisions are communicated. I think that I have to mention that I never had spoken in his name, or even mentioned it in my editorial decisions. But what else could he write, in order to finish our collaboration? Wel said1!!! They are really bady!!!!1!11!! Wim: This editor, RM Wittich, apparently did not really understand the fundamentals of Frontiers review policy. Her comment on “outstanding” science being a real criterion is just naive. Everyone who takes the time to learn about the Frontiers approach to review should know the difference between the ad-copy adjective (“outstanding”) and the formal and clearly enunciated Frontiers policy: namely, that reasonably well written reports that make useful scientific contributions—not necessarily high impact or cool—can be submitted, improved by a relatively open review process (with acknowledged reviewers), and published only if both reviewers and the associate editor are satisfied with the final product. Yes, as a result Frontiers has relatively high acceptance, but that is far from “predatory.” Frontiers journals are not there to just find the best, but to help make good science. Frontiers has done a lot for OA, as much or more than PLoS. I appreciate our Wiley IBANGS journal, Genes, Brain and Behavior (G2B), but it does suffer somewhat from being closed access back through to 2016. Even Maxson’s obituary to Ben Ginsburg is closed (Nov 2016). One could argue about just who is predating whom. I am not sure Leonid Schneider is the blogger that senior scientists will want to trust as a reviewer of the science publication method. He obviously has a serious ax he is grinding. This is a complex business as you know very well. If there is a boogey man, it is far more likely to start with the letter E than F.
Rob, I’m not going into the Frontiers thing at this point, except to remark that their publishing policy sound like that of PLOS ONE (all solid science is accepted, regardless of novelty or sexiness). I have edited a lot for PLOS ONE (and still do so from time to time), and never had problems when rejecting a paper because the science wasn’t solid. I think the assertion here is that Frontiers makes it difficult for editors to reject, even if the science is not solid. However, I take issue with your remarks about G2B being “closed”. a/ Every member of IBANGS (the society who co-owns the journal with Wiley-Blackwell) has full access. If you don’t, then contact the society to have this corrected. b/ G2B is part of a large package of journals that Wiley-Blackwell sells to many libraries, so that people at more than 1000 institutions (I don’t know exactly how many, it may be much more) have access. Institutions in countries with budgetary problems get access for free or vastly reduced rates. (To any other people reading this: I am aware of the criticisms against these “bundles”, but I’m addressing the issue of being “closed” here). So, yes, certainly, institutions pay for access to G2B. But somebody has to pay the bills and publishing is expensive if done well. In the past two years published three articles that came out of our BXD project in G2B, which didn’t cost me a penny. If I had published in an OA journal, I would have paid anywhere from $4000 to $6000 out of my research money. Here in France, that’s a big chunk of my budget (to give you an idea, we recently ran a large pharmacological experiment and it cost me about a little more than half that amount-if you don’t have to pay for salaries, overhead, or mouse per diems, then $5000 goes a very long way). And G2B is on the verge of starting to make profits. Which will be shared with the society, to pay for travel grants, invite speakers at the meeting, whatever the society wants.If you call that predating on the scientific community, be my guest. Hell yeah. all of Frontiers is nothing more than cow pie! You have a way with words Mr Schneider. What has Mr Trump got to do with it? If there is one publisher that is master in spreading fake news it must be Frontiers, in the same class as Spandidos publications and Impact journals (Oncotarget). May I venture a bold (read: cynical) guess? PC = publication charges, meaning the Authors are affiliated with institutions for which charges are not waived (because they’re from developing countries, for instance). Actually PC = Potential Contributor, i.e. a list of people who were directly invited to submit to the special issue. Of course, Leonid already tweeted the above tinfoil hat theory without attempting to verify. This is what passes as ‘investigative’ journalism nowadays. Is it you again, Fred Fenter? I doubt this is Fred. More likely, it’s one of the many Frontons proud of the legitimate publisher they work for, like me. Your allegations have the potential to hurt real people, who believe in the company mission and whose families also do. You can easily very such claim with Regina, if she were such a committed editor in chief she will surely remember as PC lists are an important part of Research Topics. One last personal opinion: it isn’t required to be an “expert of investigative journalism” to know what your own company does, just like it isn’t needed to make big claims on Twitter and attract followers. If you are such a dedicated Frontiers employee, why I are you hiding behind fake email & scrambled IP to attack a former editor who signed her report? Show your face, you sad Frontiers Media SA troll! … and just seen: publication charges for Frontiers in Microbiology increased by 20%, compared to last year. The editorial should indeed pay the Guest Associate Editors who got their proposal for a Research Topic accepted, a certain amount for recruiting authors for it; in the past they got nothing for doing this job. Dr. Wittich, do you typically get paid by publishers or societies or funding agencies to review manuscripts or applications? I do not. I will admit to getting a bit grouchy about reviewing for the big for-profit publishers who maintain closed-access high-impact journals. But I do not mind reviewing for smaller society journals or open-access journals. Scientists may be somewhat irrational philanthropes for reviewing for free, but we do list most of these activities on our CVs. Our institutions usually support or even insist on this effort. My university pays me indirectly to take the time to read papers, write reviews, and assemble special issues. I would be much more concerned if assembling a special issue was tied directly to fiscal reward. That would probably quickly lead to bad outcomes. I have worked happily for Frontiers since 2008 and have visited three or four times and talked with Kamila Markram and Fred Fenter at some length. I may be biased, but I also happen to be well informed. Great staff and managers, who have always been responsive to my concerns and suggestions. The Frontiers system keeps getting better as a result of some of the constructive criticism. The criticism in this blog however, is not intended to be constructive; it is apparently intended just to hurt. I have never received any money from Frontiers and don’t expect to. I am delighted to see a strong OA publisher appear out of the blue. Building Frontiers took vision, guts, and good management. Dr Williams, please allow me a fact-correction. Dr Wittich was associate editor at Frontiers, not reviewer. Indeed, reviewers are unpaid, but it is quite common for journals to remunerate their associate editors. Also, your reference that Frontiers is not one of “big for-profit publishers” is only partially right. Frontiers are owned by Holtzbrinck, which i hope you will concede is a big for-profit publisher. I will now go back to grinding my axe, as you put it, hoping you will one day specify what my reasons might be. Do you have data or a link on those statements about ownership? To the best of my knowledge your statement is wrong, if you mean to suggest that Frontiers Media SA is a wholly owner subsidiary of the German publisher. But more importantly: It is not ownership per se that matters. It is making papers and data openly accessible to scientists, and our funders, and the public. Frontiers has always been strongly committed to open access to all types of articles to scientist and the public, world-wide. And unlike a great majority of journals, readers knows who handled and reviewed the work published in Frontiers. Frontiers is leading in review transparency. Don’t you think you can find a more worthy target for your drawing pen and ire. Making fun of a few odd papers is child’s play, and you know that one can do this just as easily with Nature, Lancet, and Science as targets. You can also ask Drs Markram and Fenter, if you prefer an objective source of information. I really would like to know how much of Frontiers Markrams still own. I still hope you might find time to indicate why my Frontiers reporting is a form of revenge or a ground axe. I worked for Frontiers for four years as an associate editor, unpaid, as for many other journals as reviewer and/or associate editor. Frontiers pays specialty chief editors (like me in those days), as well as field chief editors. I think that I understood the review (and editorial) policy of Frontiers very well, and I had indeed a very fruitful collaboration with the editorial and also technical staff of Frontiers, including my SCE companion, except a few (here unnamed) persons who – very obviously – have had the growth, but not scientific quality in mind. I think that you will agree that the editors as specialists in their area of expertise should be able to decide what type of manuscripts may fit into an established research topic, but not the so-called journal development specialists which are far away from being those experts which should make such decisions. And just by the way: I keep on as a reviewer for a number of journals within my field, as well as an academic (meaning associate) editor for PeerJ the OA editorial policy of which I like much more than that of Frontiers which has a supervising system of staff installed, sitting in state and mainly controlling the financial growth of the Holtzbrinck publishing Group. I submitted a manuscript to a “special issue” in Frontiers in Microbiology in November of 2015, and after one month, two reviewers (1# and 2#) sent their comments and “destroyed” the manuscript. The peer reviewing process of Frontiers allow the authors to reply in an interactive forum, so we ask 4 months to do some additional experiments and analyses and re-write the manuscript. The guest Editor gave me that opportunity. After 5 months I resubmitted the manuscript with new experiments, including novelty next-generation sequencing analyses… With this, both reviewers withdraw, and after 3 months, the editor/frontiers still did not have assigned new reviewers… Therefore, I asked the editorial office to transfer the manuscript to a “regular issue” of Frontiers in Microbiology. In October of 2016, it was assigned an Associate Editor and two new reviewers. In December, the reviewer 3# sent his/her comments pointing to major revisions. The reviewer 4# sent his comments in January of 2017, also pointing to major revisions. Both reviewers were amazing and helpful pointing to some weakness of the manuscript that should be improved. Once again, I asked to Associate Editor two months to perform the major reviews, which was allowed. I resubmitted the manuscript in late February. In March both reviewers sent their new comments, reviewer 3# still had major problems and reviewer 4# had minor issues. In April 2017, again, I resubmitted the manuscript that was endorsed by reviewer 4#. Once again, Reviewer 3# still had a major issue with a section of the manuscript. Therefore, in the revision forum, I reply to the reviewer that if he was not comfortable with that section, I would withdraw the section from the manuscript, if the Associate Editor and reviewer 4# had no problem with that. Only the Associate Editor reply, saying that the manuscript was long and had nothing against, and the Editor also made several comments, mainly regarding English mistakes, to improve the quality of the manuscript. I re-written the manuscript, without the section that the reviewer 3# did not agreed, and I re-submitted. One day later, the reviewer 3# endorsed the manuscript. Meantime, the Associated Editor sent some other comments regarding some minor issues that she would like to be improved. After dealt with this, the Associated Editor accepted the manuscript for publication. It was my first time that I submitted a manuscript to an “open-access journal”, and I had previously published more than 10 manuscripts in JCR Q1. But, it was the most irresponsible thing that ever happened to me in a peer-reviewing process, and a lot of stupid things happen in the peer-reviewing process. The Specialty Chief Editor Regina-Michaela Wittich “reasons” were: “I have strong concerns regarding the experimental approach, experimental procedures, and the interpretation of the obtained results”. After an exhaustive 20-month long review process and having been accepted by the Associate Editor and having favorably completed endorsed for publication by two expert reviewers?! Of course that I tried to revert her decision, appealing to her with CC to Editorial Office and the Associate Editor. However, the Specialty Chief Editor Regina-Michaela Wittich reply was outrageous, she mocked with our arguments, basically, she said that she could do whatever she wanted, even overwrite the decision of her colleague Associate Editor and the two reviewers. This reply was enough to one of the authors wanted to go to Granada to make her a “visit”, because she mocked with the work of several authors, two reviewers, and the associate editor. But definitely, this it was not worthy of the “visit”. I realized that it would be impossible to revert her decision, but, anyway I appealed to the Field Chief Editor, which could overwrite the decision of the Specialty Chief Editor Regina-Michaela Wittich. But the Field Chief Editor supported her decision… I can understand, because I would do the same, by support my co-workers… something that Specialty Chief Editor Regina-Michaela Wittich did not do with her co-worker, the Associate Editor. In mid-May 2017 I had a personal problem in Lausanne, and since I did not have anything to lose, so I “schedule” a meeting with the Editorial Office, someone had to explain how this was possible. In the day before of the meeting, the Ethics & Integrity Manager of Frontiers sent me an email supporting the decision of Specialty Chief Editor Regina-Michaela Wittich stating that legally e ethically, she could do that. For me, it was the end, I promised not to submit as principal researcher any other manuscript to Frontiers. But now, I will give a little bit of my opinion. Regrettably, the Specialty Chief Editor took me the opportunity to know the name of reviewers, and the opportunity to acknowledge to them personally their profound and constructive criticism in the interactive review, as we expect in a reviewing process. The suggestion and criticism raised by the reviewers throughout the 20 months reviewing process greatly improved the manuscript. To end my comment, I just want to thanks the Specialty Chief Editor Regina-Michaela Wittich for saving me US$ 2,950 in article processing charges (fees). The work, accepted and then rejected, was published with minor changes in a journal with higher impact factor than Frontiers in Microbiology. Moreover, a similar study was recently published in Nature journals confirming the “interpretation of the obtained results” that Specialty Chief Editor Regina-Michaela Wittich had several concerns! It is correct that I made an end to a long-winded story exchanged between reviewers and authors; and it is also correct that, in the end of it, even reviewer #3 endorsed your ms for publication although a huge number of her/his criticized aspects in the last version of your numerous resubmissions was not any more considered by the authors for a fundamental improvement of your work, an improvement which – in my opinion – was not possible at all because a number of shortcomings in the early experimental setup. As the reader can see below I had invested a huge amount of time in critically reading the text of your last resubmission, as well as to understand the process of multiple, repeated and again repeated reviewing in your case. Below the reader may find my arguments which – very obviously – had been shared with the field chief editor, Dr Martin Klotz, as you mentioned above in your post. Unfortunately, I have to inform you that your manuscript “Potential for naphthalene and fluoranthene degradation under dissimilatory nitrate reducing conditions – shifts on an indigenous estuarine prokaryotic consortium” cannot be accepted for publication in Frontiers in Microbiology, section Microbiotechnology, Ecotoxicology and Bioremediation. Objective errors in the methods, applications, or interpretations were identified in this manuscript that prevent further consideration. The submitted MS is not without merit, and a huge amount of work had been invested by the authors. – The authors claim, or suggest, a correlation between the anoxic degradation of two model PAHs and dissimilatory nitrate reduction/nitrate respiration. 1) The degradation of the PAHs is questionable since all microcosm should have been spiked before the start of the experiments with the total amount/ of a final concentration of 50 mg/L. Taking into account the volume of the sediment slurries of 40 ml each one, the initial amount was always 2,000 microgram per microcosm. The recovery by the applied analytical methodology, however, at the beginning (T0) and also in all autoclaved control systems was much less; the data for naphthalene at T0 only 400 of the theoretical 2,000 microgram, equivalent to just 20%, and in the control much less, about 11 %. The same, more or less, applies to the results obtained from all the systems, providing strong evidence for a profoundly inadequate analytical procedure. With a lot of good will, a slight tendency for PAH depletion over time may be assumed. Furthermore, the authors added an “internal” standard (neither defined by the identity of this compound, nor by the amount/concentration) to the microcosms; obviously for the calculation and correction of recovery rates. However, they did this at the end of the work-up procedure, but not, as per its definition, at the beginning: a useless action. 2) The possibly involved catabolic genes: Apart from the fact that the authors did not mention whether their inocula were taken from oxic or anoxic sediments, one has to take into consideration that such sediments, as having a long-term history of contamination by PAHs, may obtain organisms and their respective genes of both oxic and anoxic PAH catabolism. Here, I would have expected that the authors would have not only detected such ones, as foreseeable, but would have shown -at least – their increase of prevalence over time, or their expression, as they claimed high activity rates. There is no doubt that dissimilatory nitrate reduction may indeed have occurred; but one has to take into consideration that both sediments contained a certain amount of organic material; about 2 % the sandy one and about 10% the silty/muddy one. Which may explain a shift towards the expected respective organisms. Although Reviewer 3 endorsed this MS for publication, a profound criticism was provided in the interactive review, containing a number of details which may be considered in future work. At Frontiers, improving peer review has always been a priority. Our unique system is engineered to be rigorous, yet at the same time efficient, collaborative, transparent and fair. As you can see, each story has several points of views. I am glad that Specialty Chief Editor Regina-Michaela did not share our reply to her decision letter, and above all, her reply to our argumentation. But yes, I am disappointed with me since, in the previous comment, I forgot also to thanks the Specialty Chief Editor Regina-Michaela Wittich for this last comments in the decision letter, which in fact improve the manuscript. Nevertheless, I still loved to know the others sides of the story. The Associate Editor story, the one that would have credit for the manuscript, she showed “love” for the manuscript. For sure, it was the Editor that most contribute in my manuscripts, and at the end, Specialty Chief Editor Regina-Michaela Wittich stole the credit from her. I wanted to know the real opinion, the one from the Associate Editor that approved the manuscript for publication, not the opinion of a co-worker of Specialty Chief Editor Regina-Michaela Wittich. But above all, I would love to hear the reviewer 3# opinion, which lost a lot of time and effort. Actually, I felt love and passion in his/her reviews, he/she was really trying to help… I consider that he/she added more “love” and scientific knowledge to the writing of the manuscript than most of my co-authors. I am really thankful to him/her. To end my comment and my participation in this post, I believe that peer-reviewing process needs more love and passion from authors, reviewers, and editors. It is easy to reject a manuscript, but to be helpful and improve the manuscript it needs a lot of work and love from reviewers and editors! And I am not saying to accept without quality, but to improve the ones with potential to finish with quality! Therefore, readers of For Better Science, to improve Science “all you need is love”! In fact, Specialty Chief Editor Regina-Michaela Wittich, even after you reject my 20-month manuscript, I love you for your comments that improve the manuscript. In my experiences it seems to be a fact that Frontiers is indeed taking (nearly, exceptions to be found on their web pages) everything, and this applies for a number of scientific journals. Since long, I am receiving nearly every day invitations from up to three journals (from many of them never heard before) to submit manuscripts although some of these brand-new (OA) press products don’t show adequate experts within their associate editors and/or boards of reviewers. And for several journals like Chemosphere or Applied Microbiology and Biotechnology, amongst others, I stopped already years ago to take invitations for review as I had to learn that profound critical reviews were not wanted although those journals claimed it within their requirements for submissions…..
As associate editor of a Frontiers section (unpaid, btw), I’d like to point out that while it is true that too many Frontiers articles get published that shouldn’t be, it would be necessary to judge the data, rather than data points, and as relative to similar journals. Without evidence, cherry picking is rather easy. Although it is perhaps not widely known, but Frontiers has changed a lot over the years: there were no proper possibilities for rejecting a few years ago (reviewers could only withdraw), these are now implemented: Reviewers get to suggest rejection and reasons for doing so are clear to other reviewers as well as the editor. As a result, my own rejection rate (which is after the editor does desk rejection) stands at 33% (higher, I think, then PLOS ONE). What I would still like to see is double blind reviewing (until acceptance), which is becoming a standard in many fields, but I understand that makes some people a bit anxious as well!. That said, I believe the extreme rate of growth, and some bad implementations of the peer review system, have lead to a pretty poor reputation for the journal, making it rather difficult to find willing expert reviewers sometimes. Perhaps, however, Frontiers should receive some amount of credit for the recent changes, as should the many scientists who still go through the lengthy process of doing proper, rigorous reviewers, before both are judged unfairly. Nice, maybe my reporting bore some fruit. In this regard, why are you not signing your comment, and why did your publisher and even specifically your journal block me on Twitter? Also, why does Frontiers in Psychology publish so much crazy and awful stuff? Or maybe you want to verify my claims on my rejection rate? Perhaps that would make sense, but I don’t believe that it helps anyone to know what person X’s rejection rate is (well, perhaps I will get stronger manuscripts to work with, but I kind of doubt that!). It would merely be anecdotal evidence whether my rejection rate is 33%, given the number of editors, the average could still be 2%, or 50% – I honestly don’t know. And even that may not help, as such percentages are bound to vary between fields and sections. (perhaps some sections accept everything, but some accepted ‘sciences’ should be referred to the scrap heap of history, IMHO, but I’m no expert in every field, and I try not to judge things I don’t know much about). As you may read between the lines, I’m hardly a staunch defender of Frontiers (or Elsevier, Harpers, etc, for that matter), and really not that cozy with its inner circle to inform you as to why they blocked you on Twitter. As to why ‘so much awful stuff’ is published – that depends on what you mean with ‘how much’, can you give a percentage (say, of the last 20 articles from your field that were published, how many were awful?). If we agree that it is too many – and it might well be! – then well, it can either be because 1) the editor got too few reviewers (2 is minimum), who 2) subsequently didn’t see the problems you (or I) see. That is, as far as I know (and again, I’m neither an agent, nor a fan of Frontiers, and claim no extraordinary knowledge), how it works in general. Frontiers hasn’t, too date, complained about my editorial rejections, or reviewers suggestions to reject. Put different: like you, I think too much objectionable stuff is published by Frontiers. Consequently, I trust some of the good old closed classics (I try to publish hybrid/green) better when I read about new research, and of course that matters. But I don’t think Frontiers is very different from competing journals of similar format, like PLOS ONE, or “Nature” Scientific Report, and at least with Frontiers, the process is a bit transparent. Every awful paper is one too much. It is not about bibliometrics, statistics, or ratios, it is about whether a publisher is willing to stop garbage from being published. Publishing tons of papers for paying customers is NOT an excuse. Frontiers, and sadly your Frontiers in Psychology, published a number of very awful and ridiculous papers. Not enough? How about paranormal quackery? PLOS One retracts occasional crap which slips though, like they did with that “Hand of God” paper. But Frontiers? Invites more of the same. But here you have an example you will appreciate, affects both Frontiers and Scientific Reports. The problem with Frontiers now is that it is owned by one person who has the upper hand in the rejection or acceptance of any submitted paper by the name of Riccardo Ferrera (Ethics & Integrity Specialist) with no Ethics or integrity and distributes his lies with no person to judge his misconduct. Off course I have all the e-mails that approves my allegation. Solve the problem of the Ethics & Integrity Department and we will find a very crystal clear Journal. Although these examples hardly indicate the relative amounts, I much agree, it must become easier to retract articles after they got published. Just writing a few comments below the articles themselves is hardly sufficient. I’d be happy to raise this as a point during the next meeting with ‘my’ Frontiers.